An old and reclusive art, glove making has been intertwined with human culture since the days of the caveman. The first gloves resembled crude mittens. As the years passed, glove making became more of a refined art. Articulated fingers were stitched in to provide more dexterity and ease of movement. While glove makers' guilds once dominated in a society obsessed with a covered hand, today very few remain. Fewer still are the patterns available for hand-made gloves. Machine sewn and hand-finished gloves are mostly what you'll find in the market. Gloves are seen in ancient writings, such as Homer's The Odyssey, in which Laertes is said to wear gloves in his garden so as to avoid the brambles. There is some debate over the translation of this text. In The History of Herodotus, written in 440 BC, Herodotus describes how Leotychides was given a bribe in the form of a gauntlet overflowing with silver, which later incriminated him. As years passed, the complexity and versatility of gloves grew. 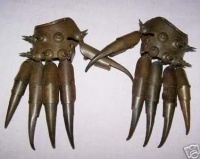 Plated gauntlets are dated back as far as the early 14th century. Before that, mail gloves were worn. Some knights were cited as wearing mail gloves under their plated gauntlets for added strength. Now, if we look to the fashion world, we see a marvelous array of styles. Cloth and leather gauntlets displayed intricate embroideries. Ladies in the 19th century adored opera gloves. One peculiarity is that they tried to fit their hands into gloves a size too small! This forced one's hand to rest in a half cupped position - perfect for greeting, but not for kissing. If you have ever attempted to don a glove you are too big for, you realize what a task these women undertook! Buttonhook and powdered alum provided some lubrication, but still, before an opera, determined women would sit for hours, coaxing their hands down into tight gloves. Few tomes remain that give us real insight of early gloves. One of the more revered in existence today is Le Gant. The book, while entirely in French, reveals many patterns and divulges a brief development and history of the glove. Also included are passages telling us of the period's social relevance and sexual significance pertaining to the glove. Insulation from the heat or cold. Protection from scratches and cuts. The instigation of duels. Bold or minute fashion statements. Gloves have worn many hats, so to speak, throughout history. They continue to be a wholly integral part of many jobs today. Conversely, there has been a sharp decline in the use of gloves as fashion accessories over the past several decades. Fewer and fewer girls attend their proms with gloves. Fashion is a fickle thing, and only time will tell the future of the glove. Glove enthusiast, Taylor Hartley, conducts and posts research regarding all types of gloves. 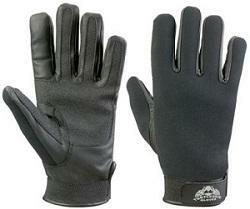 For more information regarding industrial and personal use gloves, visit http://www.unitedglove.com.